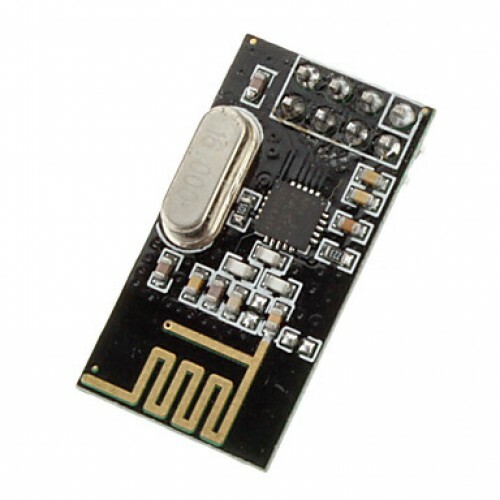 Buy online NRF24L01 2.4GHz Wireless Transceiver Module in India at low price from DNA Technology, Nashik. Great little solution's for wireless control capable of up to 2mbit communication with a range from 40 to 100m. Has on board antenna. The nRF24L01 is a single chip 2.4GHz transceiver with an embedded baseband protocol engine (Enhanced ShockBurst™), designed for ultra low power wireless applications. The nRF24L01 is designed for operation in the world wide ISM frequency band at 2.400 - 2.4835GHz. An MCU (microcontroller) and very few external passive components are needed to design a radio system with the nRF24L01. 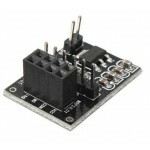 The nRF24L01 is configured and operated through a Serial Peripheral Interface (SPI.) Through this interface the register map is available. The register map contains all configuration registers in the nRF24L01 and is accessible in all operation modes of the chip. Low application cost: NRF24L01 integrated part of all high-speed signal processing related to RF protocol, such as: automatic retransmission of lost packets and automatically generate response signals, etc. NRF24L01+PA+LNA SMA Antenna 2.4GHz Wireless Transceiver Communication ModuleThis wireless Transceive..